The problems connected with high levels of gas-dynamic non-stationary loads at different stages of the BURAN Orbiter flight, and ways of their successful solution are briefly set out in the paper. trajectory specific for vehicle injection into orbit, at which the range of transonic velocity is practically synchronized to a zone of maximum values of dynamic pressure. It is necessary to note that at the time of beginning of BURAN Orbiter development there were practically no reliable outcomes of researches in the field of non-stationary gasdynamic loads on space flying vehicle. To obtain solution of a set of problems on levels of shock-wave and acoustic loads, and of noise levels in instrument bays and cockpit at all operation phases of BURAN Orbiter operation the schedule of joint works was created with engaging of a number of leading firms and institutes: NPO ENERGIA, TsAGI, TsNIImash, NIITP, NIIKhimmash, REMMASH, LII and others. The main efforts were directed to organization of different model tests with simulation of, to some extent, real conditions, since the calculations, in view of the most complicated physical processes, could not give the estimation of loads levels with the necessary reliability. The precision systems of measurement, registration and processing of fast-alterable parameters were created, mainly on the basis of imported equipment and instrumentation, to comply with the requirements on accuracy of experiments results. noise levels in instrument modules and cockpit. The main outcomes of research of launch loads were obtained on unique test benches in NIIKhimmash and REMMASH, where the tests of a 1:10scale models of launching devices and the ENERGIA-BURAN were conducted. Solid rocket propulsion unit (SRPU) with a thrust of 40 tons was applied to simulate the work of main engines of ENERGIA RL. Inadmissibly high values of launching acoustic loads (AL) were obtained at the first stage of works. So, for example, the shock-wave loads on a tail part of the Orbiter reached intolerable values for Orbiter construction of ΔР ~ +0,15 kg/cm2. Therefore, proposals on optimization of a firing sequence of propulsion units (PU) of a central (C) and site (S) modules were developed, pursuant to which, first, for preliminary stage, the engines of C module were to be started, and only in 8 seconds, when air in the gas ducts of launching facility was boosted, propulsion unit of S modules were to be actuated (Figure 1). Besides, by the results of numerous model tests, the three-layer system of water feeding into gas jets of PU was created, which operational mode was synchronized with the firing sequence of RL propulsion unit. Implementation of these proposals and installation of acoustical shield on launching facility have decreased a shock-wave loads in 3 … 4 times and of acoustic loads levels – by twice, mainly those on the side surface of the Orbiter. The parametric researches of shock-wave and acoustic loads dependence on parameters of gas jets (thrust, pressure, temperature, Mach number, contents of burnt products, etc.) were simultaneously worked out, which have allowed to create a technique of re-calculation of the outcomes of model tests under the real conditions. The second kind of non-stationary loads exerted on the surface of FV are the pressure fluctuation in a turbulent boundary layer of airflow. The maximum levels of pressure fluctuation are observed in the flow separation zones and in the zones of shock wave-boundary layer interaction at flight at transonic speeds. The levels of load are proportional to dynamic pressure of airflow and intensity of shock waves. 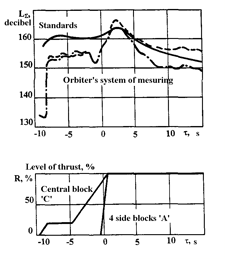 At injection of the BURAN orbiter into orbit, the zone of trans-sonic flight practically coincided with the zone of maximum values of dynamic pressure. That resulted in sharp increase of load levels in some zones of Orbiter’s surface, by its sum total level comparable with the loads at start, but lower by size than the zones of interaction. To investigate this class of loads models in 1:10, 1:18, 1:30, 1:50 scale were used. Models were tested in the wind tunnels of TsAGI, mainly in T-109, which was specially upgraded with the purpose of reduction of acoustic background of the facility itself. The flight researches in parallel were organized with the purpose of studying the dependence of loads upon Reynold’s number in all expected range of alterations and were fulfilled with using the BOR-5 model and the MIG-25 flying laboratory. As a result, the technique of recalculation of the model test data under the real conditions for this type of loads was created. The third direction of the works - determination of noise levels in a cabin and instrument bays. These works were needed to make conclusion on reliable functionality of the equipment of BURAN different systems. The forecasted loads exerted on the external surface of the Orbiter were taken as the input data for these works. definition of sound insulation and sound absorption factors on the samples of construction materials, tests of model and full-scale fragments of construction in acoustic chambers, including in the newly created an AK-11 acoustic chambers. The mentioned works resulted in values of designed acoustic loads and noise levels in the cabin and instrument modules of the BURAN Obiter, on the basis of which the ‘ Acoustic Strength Standards’ were created and approved by the directors of the firms: Dr..Lozino-Lozinsky G.Ye (NPO Molniya), Mr. Glushko V.P. (NPO Energia), Mr. Mozjorin Yu.A. (TsNIImash), Mr. Svishchev G.P (TsAGI) and agreed with the Customer. To differentiate the loads differentiation, the whole surface of the airframe was conditionally sectioned into specific zones obtained as a result of calculation of streamlining of the Orbiter and model tests. For each zone of the surface the load alteration depending on the flight time were given according to certain trajectories of the Orbiter launch and descent. The load was characterized by summed up levels of mean square values within the range of width of one hertz, phase velocity, and longitudinal and transversal scales of correlation. At TsAGI, the largest in the country reverberation chamber of a volume of 1500 m3 was put into operation, equipped with modern instrumentation and intended for testing large fragments of BURAN construction (nose fuselage section, middle fuselage section, rear fuselage section, wing, etc.) with simulation of equivalent modes of load compliant to ‘Acoustic Strength Standards’. The tests were continued for several years and confirmed the reliability of construction and availability of the required service life; they were completed with issue of conclusion on the first flight of Buran. The direct measurements at start and flight of the BURAN Orbiter were the final stage of researches, when with the help of onboard measurements system the levels of AL measured in certain zones of the ORBITER surface confirmed the predicted AL levels. Figure 1 shows of designed and measured values time history of summed up AL levels on the end surface of rear fuselage section and firing sequence of RL propulsion unit are displayed. Figure 2 shows the 1/3 - octave spectrum at the moment of the launcher’s detachment from the launching facility (τ - 3 sec). The construction of the BURAN passed the tests excellently. It is enough to tell that in spite of the impact of vibration-acoustic loads, not a single heat-protective tile was lost out of more than 36 thousand complete set of them mounted on the orbiter. Now NPO Molniya has a huge material on all complex of acoustic problems, including the problems specific for the Aerospace system, which are thermal and acoustic effects from orbiter’s PU jets on the surface of the carrier-plane. This allows making authentic prognoses with a minimum scope of load testing for every class of launchers and aerospace systems. In conclusion, it is necessary to tell that the successful solution of the whole complex of acoustic problems was possible due to the well organized, highly professional work of the large team of scientists, engineers, testers and industrial workers of different corporations and institutes. Here is a far from complete list of persons, who made their great contribution into the common cause: Mr.: Voinov L.P., Okhotnikov O.I., Shelin A.V, Mrs. .Zhukova L.A. (NPO Molniya), Mr.: Munin A.G., Yefimtsev B.M., Pimshtein V.G. , Tkachev A.A., Bibko V.N. (TsAGI), Reshetin A.G., Dementiev V.K., (NPO Energia), Antonov A.N. (NIITP), Syrchin A.F., Khotulev B.A. (TsNIIмаш), and many others.